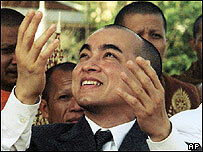 Norodom Sihamoni has been named as Cambodia's new king, a week after his father Sihanouk's abdication. A nine-member throne council voted in favour of the former ballet dancer, whose only previous public role was as Cambodia's ambassador to Unesco. A statement issued by the council said Sihamoni should be referred to as king with immediate effect. He is due to be crowned later this month. The hunt for a new monarch was sparked by Sihanouk's abdication last week. There was no legal provision in the event of a monarch's abdication, and laws had to be rushed through Cambodia's parliament to enable a throne council to convene and choose a successor. Prime Minister Hun Sen, acting head of state Chea Sim, two top Buddhist monks and other senior political figures - usually loyal to Hun Sen - made up the nine-member throne council. Earlier this week Hun Sen publicly stated his support for King Sihamoni's appointment, as did Sihanouk, so Thursday's announcement has come as no surprise. But nevertheless this is a remarkably smooth transition in a country better known for its political upheavals. The first task of the new king will be to come home. He is currently in the Chinese capital, Beijing, with his father, who is receiving medical treatment. Both men are expected to return to Cambodia next week, and a coronation ceremony has been planned for later this month. When Sihanouk announced his abdication last Wednesday, politicians initially hoped he would change his mind. Prince Ranariddh - another of Sihanouk's children and head of the National Assembly - even went to China to try to persuade his father to stay on. But once it became obvious that Sihanouk would not reverse his decision, speculation mounted that King Sihamoni would be chosen to succeed him. Prince Ranarridh - by far the best known of Sihanouk's 14 children - has often said he would rather stay in politics than be crowned king. Both Ranarridh and Sihanouk publicly stated that King Sihamoni was their preferred choice of successor. Prime Minister Hun Sen also backed King Sihamoni - a man he hopes will stay out of Cambodia's day-to-day politics, unlike his father who often interfered in political decisions. While the reigning monarch used to have great authority in Cambodia, the position is now largely symbolic and wields no real power. 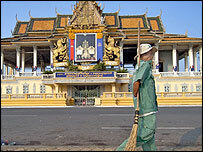 But it remains an important position because of the reverence Cambodian people give to the royal family. For the ailing Sihanouk, King Sihamoni's appointment will bring huge comfort. The 81-year-old former monarch ruled Cambodia for more than half a century, and had been troubled by the prospect that the Khmer royal line would die with him. He was also concerned that - even if the monarchy continued - there could well have been a succession battle after his death. Cambodia's monarchy is hereditary, but any descendent of the past three kings can be chosen, and there were dozens of potential candidates to chose from. "My abdication allows me to give our country, our nation and our people a serious opportunity to avoid mortal turmoil the day after my death," Sihanouk wrote recently on his website.